Who can forget the daily drama of potion class with Professor Snape? If you’ve read (or watched) Harry Potter, then you know what I’m talking about. Harry and Ron are hopeless at modifying their potions. There’s always some kind of mix-up. The two Hogwarts students are often bracing for an explosion: Malfoy’s explosive laughter, Snape’s explosive rage, or their own explosive cauldron. If they didn’t have the help of clever Hermione, Harry and Ron would never get through it. This ingredient list makes no sense at all! Where’s Hermione? With a misplaced modifier, you are modifying a word you didn’t intend to modify. You can avoid this problem by putting your modifier just before the word you are modifying. Do this and you won’t be like Ron, who modified himself instead of Malfoy when he misfired a spell. Then he got stuck with a sluggish digestive system. To illustrate misplaced modifiers, let’s talk about how bad Harry and Ron are at making potions. Harry and Ron messed up almost every potion. Wow, Harry and Ron are terrible at this. This means that most of the potions they make are failures (almost all of them). But what if the situation is not quite that dire? Harry and Ron almost messed up every potion. You can see that where you place almost makes a big difference in the meaning of the sentence. Let’s say our two fledgling wizards don’t know how to answer Snape’s question about a potion. Snape is not amused. Snape yelled only at Harry. Snape only yelled at Harry. Snape hated Harry so much that he only yelled at him. He never talked to him or whispered to him. He just yelled. Everyone pulled out their earmuffs from Professor Sprout’s Herbology class whenever Harry and Snape were in the same room. Misplaced modifiers can happen with modifying phrases, too. Thundering towards them, Ron was afraid that Snape would transmogrify them into slugs. Thundering towards them, Snape made Ron afraid that they’d be transmogrified into slugs. Now it’s clear who is being modified in this sentence. And it’s not Ron (fortunately for him). Remember: Misplaced modifiers = slimy slugs + Snape in a rage. They are bad news. To illustrate dangling modifiers, let’s continue with our potions story. Ron couldn’t answer a potion question, and now he is worried about a raging Snape. Cowering at his desk, Hermione waved her hand frantically. 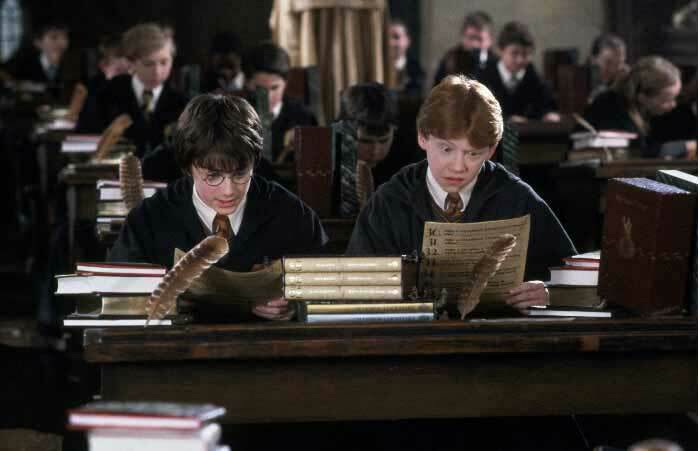 Who’s cowering at a desk, and what does that have to do with Hermione? Right now, Hermione is the subject of the sentence, and she’s too brave to cower. Let’s fix this by adding in the true subject (Ron). Cowering at his desk, Ron saw Hermione wave her hand frantically. Hurrah! Hermione is coming to save the day by answering that question! Ron owes her big time. While blurting out the answer to Snape’s question, Snape sneered. While Hermione blurted out the answer to Snape’s question, Snape sneered. Remember: Dangling modifiers = Quidditch match injuries + Snape in a bigger rage. They can cause a lot of damage. Snape’s attention is now focused on Hermione, who is trying to answer the potion question. “Children who seek attention rarely are intelligent,” pronounced Snape darkly. Ouch! But what is Snape saying? Is he saying that children who seek attention once in a while (rarely) are intelligent? I’m guessing that’s most of his class (including Hermione, who’s learned not to seek his attention except under desperate circumstances). Nope, that’s too nice for Snape. Does he mean that children who like to get attention are usually stupid? Probably. But the sentence is not clear, because the modifier rarely is between attention and are intelligent. Whatever he said, Hermione doesn’t like it. And she knows how to master modifiers. “Teachers who bully others often are compensating for their insecurities,” retorted Hermione. Does Hermione mean that teachers who bully others a lot (often) are insecure? Or does she mean that teachers who bully others are often insecure? It could go either way here. If Hermione wanted just the second meaning, she would have said “are often” instead of “often are.” But Hermione is trying to give Snape a headache thinking it over. Great job, Hermione! Remember: Squinting modifiers = Hermione’s clever double meanings + Snape in a towering rage. They cause a loss of fifty house points from Gryffindor. This post is dedicated to TL, who asked me to write about where to place modifiers in a sentence. If you have a topic request for a future post, please contact me. ← Would Your Captain Be Proud? While blurting out the answer to Snape’s question, Snape sneered. Ha, funny! This post made me laugh, as always. I’d never heard of squinting modifiers. That’s a good name for them. very helpful! I often do these errors…and yes they can change a lot the meaning! btw, I enjoyed remembering Snape & Harry Potter…maybe I’ll watch again a movie episode this weekend! You would never believe it, Sue, but this post was freaky with its timing. My son is sitting in the next room watching a HP film. I’m slightly uncomfortable with the fluke of coincidence here, but nonetheless, delighted by yet another wonderful lesson and refresher course in modifiers. Thank you, thank you for making these posts as charmingly encouraging as you do! Okay, that’s just spooky! I’m off to get some more of that butterbeer now. 😉 And you’re absolutely welcome!